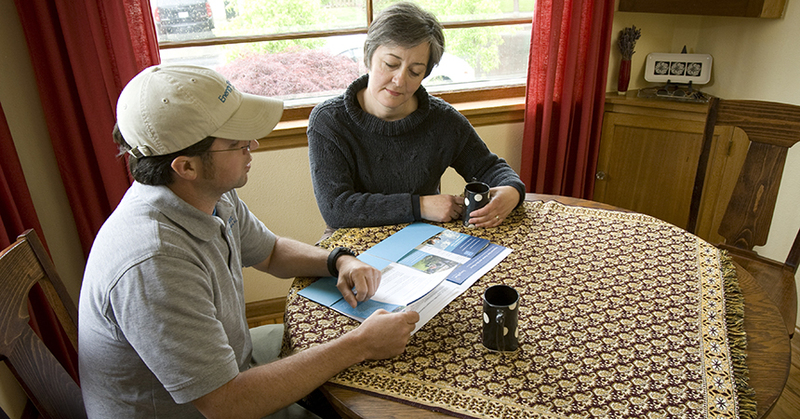 Oregon is a trailblazer nationally when it comes to home energy scoring. A voluntary statewide scoring program and a new mandatory scoring program in the City of Portland are helping move the state toward more energy-efficient housing. Starting January 1, 2018, a Home Energy Score and Home Energy Report will be required for single-family homes listed for sale within the City of Portland; Oregon Department of Energy also supports home energy scoring activity in areas outside of Portland. If you’re considering selling, buying or looking to improve a home in 2018, you may wonder what a home energy score is and where to get started. A home energy score can help homeowners and buyers better understand how a home uses energy—and what steps they can take to improve their home’s energy efficiency. Comparable to the miles-per-gallon rating on cars, a home energy score conveys information about a house’s estimated energy usage based on the physical characteristics of the home, such as square footage, insulation, window types, and heating and cooling systems. Being able to access information on energy use, expected utility costs and carbon footprint means that buyers can look for homes with lower energy costs and greater efficiency. Sellers and current owners can also learn about potential energy-efficiency investments to make in their homes that can increase their home’s value and salability. Scores may only be provided by authorized Home Energy Assessors who have been trained and certified to offer home energy scoring services. To create a score, an assessor will perform a home energy assessment and collect information about a home, such as its square footage, insulation, windows, heating, water heating systems and more. If you live in the City of Portland, the new policy will initially apply to: existing detached single-family homes; existing attached single-family structures, such as townhomes; and newly constructed homes that are either detached or attached side-by-side. If a newly constructed home is built to EPS™ standards, a Home Energy Score will not be required for the first two years of Portland’s program. EPS homes are considered to be high-performance as they are built at least 10 percent better than minimum energy code. Recognizing this value, the City of Portland allows EPS in lieu of its Home Energy Score for newly built homes until the end of 2019. To help low-income residents meet Portland’s program requirements, the City will cover the costs for low-income households to receive a home energy assessment through 2018. Some home listings are also exempt from Portland’s scoring requirement, including foreclosures and short sales. If you live outside of Portland, visit the Oregon Department of Energy web page to find out how you can get a home energy score.